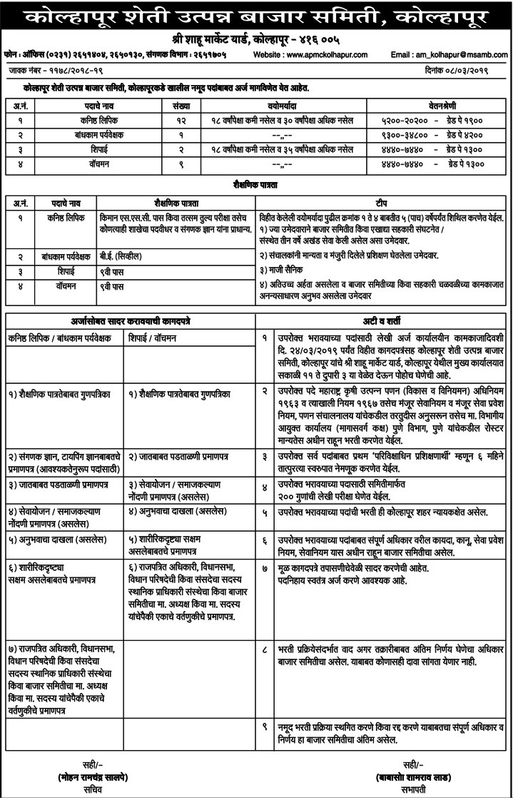 APMC Kolhapur (Kolhapur Krushi Utpanna Bazar Samiti), Kolhapur published a new job notification for Junior Clerk, Construction Supervisor, Peon & Watchman Posts. The recruitment is for total 24 Vacancies. The willing candidates are informed to see the latest notification March 2019. Qualification required 9th Pass/SSC/B.E (Civil) and More. Last Date of offline application is 24-03-2019. For More details of APMC Kolhapur Recruitment 2019 Read Below. Education Qualification: 9th Pass/SSC/B.E (Civil) and More. For Post wise Education Details follow the detailed advertisement. Interested & Eligible candidates can send their application along with all the necessary documents and testimonials to Kolhapur Agricultural Produce Market Committee, Shree Shahu Market Yard, Head Office, Kolhapur. Application starts offline 11-03-2019. Last Date of application is 24-03-2019.